It is known that the human body is under constant influence of external psychogenic stimuli, all types of radiation, cancerogenes and mutagens, including genetically modified ones. Composition of major food items includes highly polymerized substances – emulsifiers, starches, fats, different kinds of colorants. They, as well as stabilizers, preservatives and gellants, not only successfully prolong food life, but also form an excellent raw materials source for pathogenic plant, bacterial and fungal microflora successfully mastered blood and lymph. The medium of human system fluids is quite acceptable and similar to a usual habitat of different algae-like structures and primitive animals. Among those are diatoms, cyanobacteria and radiolarians. Diatoms and radiolarians have rigid silicon shell with light and strong needles as well as protective elements. When one kind of diatoms is presented in high quantity in plankton, mussel – filter-feeding bivalves stop eating at all, they close their valves in order not to damage delicate tissues by diatom needles. There are known cases of mass fish mortality, which gills were pricked by bristles. Rough mechanical effects lead to damage of cellular membranes of cells contacting with algae. Owing to small size of spores, during reproduction process the latter can easily penetrate into majority of internal and “overbarrier” organs. Similar cancerogenic mechanism can be observed when inhaling asbestos fibers and extended carbon nanotubes. Very few experts from scientific medical community draw attention to isotopic carbon composition of cell tissue. “Paradoxical” accumulation of carbon С14 isotopes in combination with microelements anomaly in a human body leads to increased mortality. It is known that among natural nuclides only carbon-14 and tritium are directly included in genetic structures of living organisms. At the same time, new stable compounds are formed only during nuclear disintegration of radioactive carbon atoms located in DNA chemical chain. It is believed that the resulted stable point mutations are either out of the cell reparation system sensitivity zone or can be hardly recovered. Result – conformation of proteins, first of all, components of the immune system. The transforming factor enhances cyclooxygenase enzyme efficiency in the spleen, which, in its turn, inhibits “maturation” of Т-lymphocytes at their constant number. This influence may suppress ability to recognize and form conjugates with target cells, ability of repeated interaction with foreign cells, as well as integral functional activity of natural killer cells population. Such changes may represent a triggering factor not only for development of malignant tumors, but also infectious deceases, especially of viral nature, as lymphocytes – natural killer cells are the first line of defense against infectious agents and transformed cells. Algae-like organisms, as nitrogen-containing structures, by disrupting blood buffering system, change activity of various forms of human body biocenosis, including protozoa. Organic substance synthesized by algae (high density lipoids) violates not only transmembrane transportation, but also it is a good additional feeding for bacteria, fungi, protozoa. Currently we know more than a thousand of microorganisms capable of processing hydrocarbons of different classes. The most productive of them are yeast cultures of Candida type, for which paraffins of algae-like organisms serve as a source of hydrocarbons. Silicon shell of microorganisms with a rigid frustule consisting of silicon plates involves ferromagnetic particles during growth, which allows manifestation of static electricity and magnetism effects. And consequently, it triggers uncontrolled magnetic scenario of chemical reactions. Generation and application of even weak electric field significantly increases formation rate of new molecules. Being negligibly small in terms of energy, magnetic interactions can switch reaction channels: open closed channels and, vice versa, close allowed ones. Paraziting microflora is able to fundamentally alter properties and nature of synthesized proteins, and, consequently, cellular material of human organism. Recently scientists have received significant amounts of data stating that glycerin constituting not less than 40 % of algae-like flora content demonstrates clear chaotropic properties at its concentration. For example, survival rate of fungi in highly concentrated glycerin is much higher than survival rate of organisms living with its lower content. Existence and development of cells of highly organized animals is only possible in the environment of kosmotropic agents structuring intracellular aqueous solutions and reducing density of water, as the synthesis and reaction of L-amino acids and D-glucose take place in environment with low density. Synthesis typical for a plant cell, D-amino acids and L-glucose takes place in a denser structure. Such conditions lead to development of an oncological process with uncontrolled and irreversible nature. Oncological tissue already has a powerful, deeply layered system of protection against oxidative stress developed by one-celled protozoa and it is able to influence all the regulatory systems of the body. Excretory products of plant pathogenic microflora form a medium of polymerized amylaceous substances – ionic colloidal solutions with high content of high-molecular polyphosphates concentrated by microalgae and glucose polymers – optical isomers with right polarization and powerful negative charge providing conditions for disintegration of multimolecular clusters of water. NH2 amino groups start to show their relatively strong basic properties. Possessing a high positive mesomeric effect, they reduce dielectric permeability of cellular solutions, thereby increasing the number of reactions with hemolytic bond breaking. It results in formation of free radicals and deactivation of enzymes involved in inhibiting D-isomers synthesis, not peculiar to an animal cell. Weakening of general antioxidant system and damage of cell membrane results in increase of oxygen superoxide and hydrogen peroxide generation in presence of iron entering a cell with hemoglobin, creating a highly active radical of iron hydroxide. These low molecular iron complexes are capable of providing any damage to any unprotected cell, its elements and therefore DNA, and facilitate further malignization. Furthermore, concentration of iron oxides in the cell, in addition to thermionic emission, is capable of causing microgravity and inertial effects. The influence mechanism can be explained by constructing a hydrodynamic model of the infusion fluids flow in the body. Additional micro accelerations of complicated nature inevitably lead to irregular convection in the liquid phase. Combination of currents and activity of pathogenic microorganisms also form gyrotactical traps, inaccessible for immunocompetent cells. The shear force, inevitably influencing on cells, “spin” them, breaking their strict direction of movement. And in areas, where this value is greater than critical, we have accumulation of free radicals, toxins, etc. The same traps can contribute to genetic diversity of pathogenic microflora, since low-frequency perturbations of low-amplitude, with which they are characterized, under such conditions can be competitive in terms of exposure on the body. Significant increase in the number of resistant strains of biopathogenic microorganisms against the background of sharp efficiency decrease and lower selectivity of existing chemotherapeutic synthetic drugs requires development of systemic, low-toxic, broad-acting analogues. Multi-component organic-mineral complexes of natural humic acids and gold compounds are aimed at stabilization of body systems exposed to influence of the above factors. The novelty of using synthesised substances is based on multi-vector influence on processes accompanying damages. Microdoses of used components including gold, platinum, silver, zirconium and other compounds are used in directed reactions catalysis at neutralization of a charge on cell membranes surface under conditions of active oxygen forms generation in affected area. Stasis, destruction or transformation of affected tissues is carried out in parallel with growth inhibition, sorption and destruction of associated viral, mycotic, bacterial and other pathogenic flora, including protozoa micro organisms and algae like structures, as well as their by-products. High efficiency is provided through bioavailability and permeability of the complex and micro doses of introduced metal-organic structural compounds which are able to block the anti-oxidant protection of pathogenic flora. One of the factors in favor of the offered complexes is the ability to control mechanisms of electron-nuclear interactions as well as a value and given direction of nuclear polarization through mediate formation of oriented molecular gyro tactical complexes in the medium. Their influence results in stabilization of structural and functional integrity of cell membranes, auto regulation of water and salt metabolism, increase of overall resistibility, normalizes oxidation-reduction potential of intracellular medium, restoration of intercellular water clathrates. 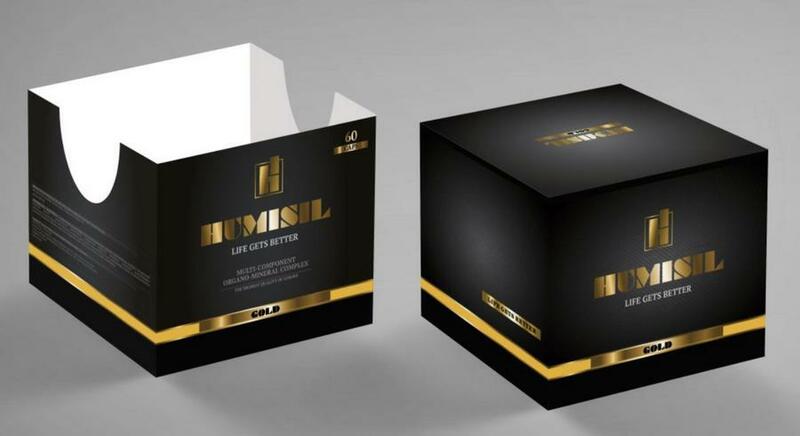 “Humisil Gold” – a wide spectrum antitumor immunomodulating agent based on ion gold compounds with a complex of natural humic substances. The supplement is synthesised basing on a bioengineered approach and combined methodology in development of effective measures for prevention and adjuvant therapy of oncological diseases, viral and bacterial infections (including HIV, hepatitis of A, B, C, D types; tuberculosis, syphilis, etc.). The product has a strong immunomodulating and antineoplastic action and it is effective as adjuvant in prevention and therapy of oncological diseases, complex viral therapy. It represents a complex of positively charged metal-organic gold ions coupled with negatively charged ions of humic acids organic matrix. Use of metals, first of all gold, is due to presence of high intracellular metabolism of electro-chemical nature during tumor genesis. Influence of ionic forms of gold on a cell affected by oncological disease is determined by influence on thermionic emission processes and conditions of super radicals fission chain reactions. Conditions of radicals fission chain reactions are violated within a poorly differentiated oncological cell and correction of cell molecular structures takes place. Reactions become wan or terminated. In a highly differentiated oncological cell, under conditions of significant surplus of free radicals, we can observe sharp increase in activity of enzymes contained in the cytoplasm of affected cells and its destruction. Use of humates as organic matrix is due to the presence of a carboxyl group, as well as free hydrogen atoms on adjacent with carboxyl carbon atom, which allows not only to withdraw formed free radicals from the reaction zone, but also to restore the immune system. In particular, quantitative indicators of Т-total, Т-active, Т-helper, Т-cytotoxic, Т-suppressor cells, natural killer cells (NK-cells), leukocytes, macrophages, thrombocytes, eosinophils, basophiles, banded, segmented, monocytes are normalized in blood. It restores immunoglobulin content in blood, decreases erythrocyte sedimentation rate, stimulates production of cytokines, including c-interferons and tumor necrosis factor (TNF-a). Due to immunomodulatory effect of the compound it can be used also in clinical dermatology for treatment of psoriasis, eczema and other epidermic systemic immunoallergic diseases. This website contains information to be studied by medical and pharmaceutical specialists with scientific research purposes. The information provided herein does not constitute an offer, proposal or deal promotion. The information available on this website must not be used for self-diagnostics and treatment, and cannot be considered as substitution of individual consultation by a qualified medical practitioner.